Max (Jason Bateman) and his wife Annie (Rachel McAdams) are highly competitive. They host game night every week for their friends Kevin (Lamorne Morris), Michelle (Kylie Bunbury), Ryan (Billy Magnussen), and his date du jour. Their neighbor Gary (Jesse Plemons) is the awkward, divorced husband of a former friend. Gary always hopes to join game night, but Max and Annie find ways to exclude him. When Max’s better looking, more successful brother Brooks (Kyle Chandler) comes to town, he joins them for game night. Always looking to outdo Max, Brooks insists on hosting the next game night, promising a night they won’t forget. Brooks sets up a murder mystery where one of the guests will be kidnapped while the others have to solve the puzzles before that guest is “murdered.” The prize is Brooks’ new red Stingray. After telling the group it will be so realistic they won’t know what’s real and what’s fake, things take a turn for the worse. Brooks is kidnapped by a real group of mob thugs, threatening his life. Max, Annie, Kevin, Michelle, Ryan, and Ryan’s date Sarah (Sharon Horgan), thinking it is part of the game, set out to “rescue” Brooks, not realizing their lives are in real danger. The beginning of each year serves as a reprieve from typically heavy Oscar nominated films that dominate the end of the year season. Typically, they are lighter fare that serve to do little more than simply entertain. Game Night fills that niche this year. I’ve said it before and I’ll say it again, I love Jason Bateman. Whether it’s his comedic timing or his irresistible charm, there is just something about him that resonates with me. His sarcastic wit and deadpan humor are on full display in Game Night. He feels inferior to Brooks in every way and it has affected his entire life. He is cutthroat when it comes to playing games, so he sees game night as a way to finally beat his older brother at something. Rachel McAdams can hold her own with Bateman. Whether its her equally competitive nature or her dancing around, taunting Brooks’ kidnappers, she shines in the role. The other standout in the film is Jesse Plemons. His character’s awkwardness verges on creepy both in his devotion to his ex-wife and his desire to be part of the game night group. Plemons plays the role perfectly, walking the line just on this side of being a sociopath. Kyle Chandler, Lamorne Morris, Kylie Bunbury, Billy Magnussen, and Sharon Horgan make for a well-rounded cast that adds to the comedic prowess of the film. If you’ve seen the trailer, you know the gist of the film. If you haven’t, don’t watch it. It’s better to go in blind. The story is well written and provides plenty of twists and turns that you most likely won’t see coming. Add to that some razor-sharp wit and plenty of action, making Game Night surprisingly smart. 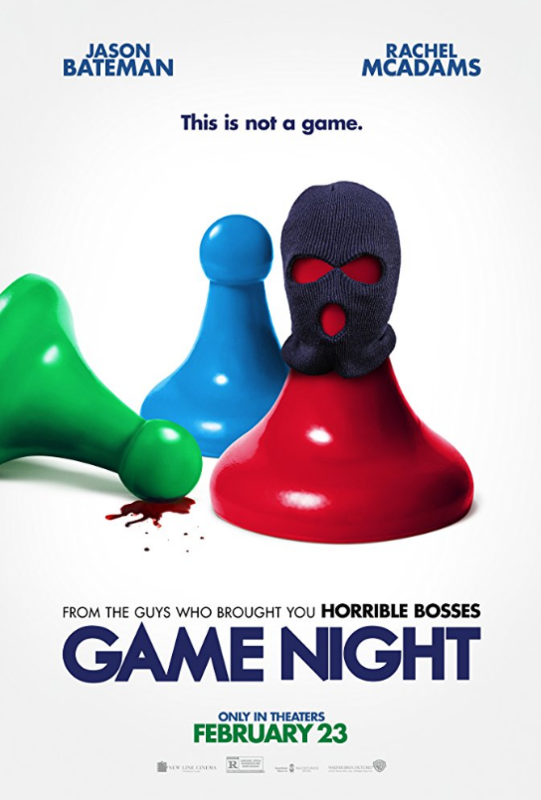 If you have checked off your Oscar list, or if you just need a break, take the time ti see Game Night. Bateman, McAdams, and the rest of the cast don’t disappoint in a clever action-comedy that will have you laughing the whole time. Need a good laugh? I did, and I got it in spades with “Game Night”. Intelligent and clever, with more movie-goers in stitches than a Sat. night ER. Never lets up. Whew. Still chuckling sitting at home. Haven’t laughed so much or so loud in years.